Programmet passer perfekt til lydanalyse generelt, men inneholder også en rekke funksjoner som er spesielt nyttige for å analysere faggermuslyd innspilt gjennom en detektor. 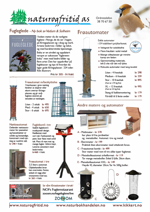 Analysis of the bat calls may be required in some situations e.g. in order to positively identify a certain species. 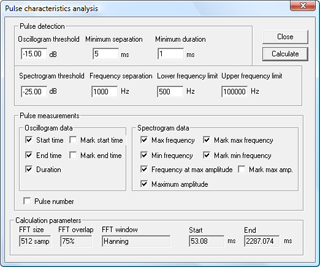 The software BatSound is an efficient, high-performance tool for various types of sound analysis. It is suitable for sound analysis in general, but also includes a number of features particularly useful to analyze bat calls recorded from a bat detector or recorded directly with a D500X or D1000X ultrasound detector. BatSound uses any Windows compatible sound card for sound input and output. BatSound supports sound formats up to 32 bits with one or two channels (mono/stereo) and sampling frequencies up to 192 kHz (for recording and playback, files of any sampling frequency can be opened and analyzed). The common WAV format is used to store files. It is also possible to open sound files with other formats such as mp3 and wma if the corresponding codecs have been installed on the computer. Multiple windows with different sound files can be opened at the same time, facilitating comparison of signals and analysis results. Printing and picture file export through Windows clipboard (BMP and WMF formats). Optional time and frequency compensation of time expanded signals to show the original time and frequency. Play Speed function to implement time expansion playback of high-speed sound files from D500X/D1000X detectors. Open Next/Previous command makes it easy to scan through all files in a folder. Very useful for browsing files obtained through unattended recording. Automatic parameter extraction feature, calculates max/min frequency, pulse duration etc. Optional grid lines in most diagrams. Clipboard export of analysis results. In the Virtual Bat Detector mode, sound files of time expanded or high speed recorded sounds are replayed at the original speed, emulating a heterodyne bat detector. Perfect for learning how to identify bats using a heterodyne detector, for classroom demonstrations etc. The Automatic Recording mode makes it possible to have the computer record sounds automatically. 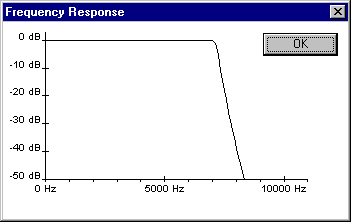 The desired threshold level is selected and the computer will start recording to a sound file as soon as the signal exceeds this level. Many parameters are available to fine-tune this mode, e.g. by setting limits for the minimum pulse length, total recording time, maximum number of pulses to record etc. Frequency-selective triggering is also available, to avoid recording undesired signals. BatSound is a registered trademark of Pettersson Elektronik AB. The software CrossOver enables Windows applications to run on Linux and OS X operating systems. For a step-by-step guide on how to use BatSound on Linux/OS X with CrossOver, please see Dean Waters' blog. 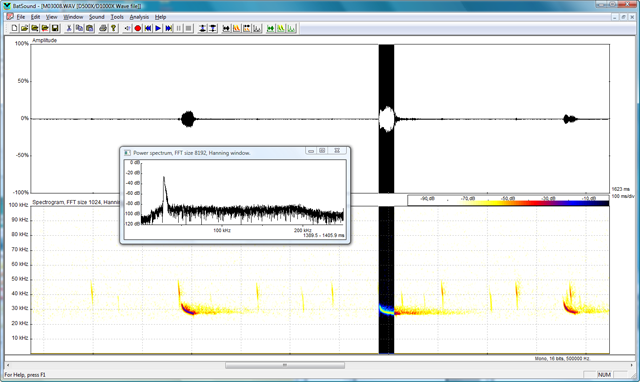 An easy-to-use and powerful tool for analysis of bioacoustic sounds. The low price makes it the perfect choice for anyone interested in advanced sound analysis. Real-time spectrogram analysis mode with high-quality spectrogram and/or oscillogram running across the screen with simultaneous recording of the signal on the hard disk! Spectrogram, Power spectrum, Zero-crossing, Pulse interval and Pulse length analyses from recorded sounds. Supports any Windows compatible sound card. Digital filtering for improving sound quality of recorded sounds. Printing or clipboard export of diagrams. Various cursor types for marking and coordinate measurements, text annotation etc. Time expansion factor to give the true time and frequency scaling in signals from time expansion bat detectors. 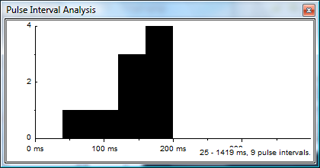 Multiple windows can be displayed at the same time to compare different signals or analysis results. Optional grid lines in oscillograms and spectrograms. Playback of sound files with time position cursor. Automatic recording mode – turns the computer into a "voice activated recorder". Virtual Bat Detector mode to replay time expanded sound files from the hard disk, as heard through a heterodyne bat detector. User defined spectrogram color mappings. 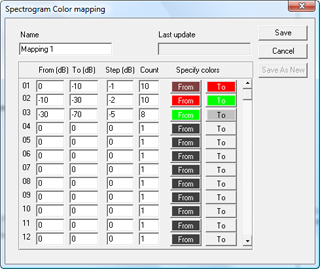 Design virtually any color mapping you wish! Reads various file types such as wav, mp3 and wma (requires codec for the desired type). Play Speed function to implement time expansion playback of D1000X sound files. "File management" function for extraction of embedded file information in D500X/D1000X files, renaming files (to include date/time and selectable prefix/suffix in file name), etc. Open next/Open previous file command to quickly scan through a folder. Cut, Copy, Paste, Insert silence, Reverse, Adjust volume, Filter and Undo edit. Using these, it is possible to enhance the sound file in many ways, e.g. to remove undesired portions of a signal or to create a new sound file by cutting and pasting sound clips from other files. The filter function enables frequency-selective editing of the sound file. Removing e.g. low-frequency noise from a selected portion of the sound file is an easy matter. The filter characteristics are chosen in the "Filter design dialog box", where it is also possible to study the frequency response of the designed filter before actually filtering the sound file. The spectrogram and/or oscillogram runs across the screen in real time, while the signal is simultaneously stored on the hard disk. Only the available hard disk space limits the recording length. After interrupting the real-time analysis, the entire sequence resides on the hard disk, immediately available for playback, further analysis or editing. 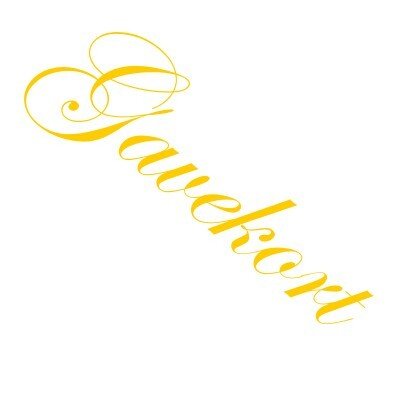 FFT sizes: 16, 32, 64, 128, 256, 512, 1024, 2048 samples. Windows: Rectangular, Hamming, Hanning, Parzen, Cosine. Versatile threshold, contrast and overlap adjustments to change appearance of spectrograms. FFT sizes: 16, 32, 64, 128, 256, 512, 1024, 2048, 4096, 8192, 16384 samples. Displays the distribution of time intervals between pulses in a histogram. Displays the distribution of pulse lengths in a histogram.